Translated into Dutch vernacular by Geert Groote. Border decoration in ‘the coloured Delft style’ and in ‘the ‘kriezel-style’. 160 x 112 mm. – 210 leaves. With 4 decorated initials, 1 historiated initial, and 14 full-page inserted miniatures. A newly-discovered, lavishly illustrated Delft book. Dutch manuscripts are fascinating and quite unique within European medieval traditions. In this rather small geographic area above the large rivers Rhine and Meuse, all major towns hosted workshops relishing a great variety of artistic styles. Delft - which later became the town of Jan Vermeer - was a true city of art and books since the early 15th century: while several religious houses were involved in manuscript production, here also the first book in Dutch was printed (1477). Delft illuminated manuscripts stand apart in painting as well as in textual traditions. However, they are relatively rare, since the town was largely destroyed by fire in 1530. 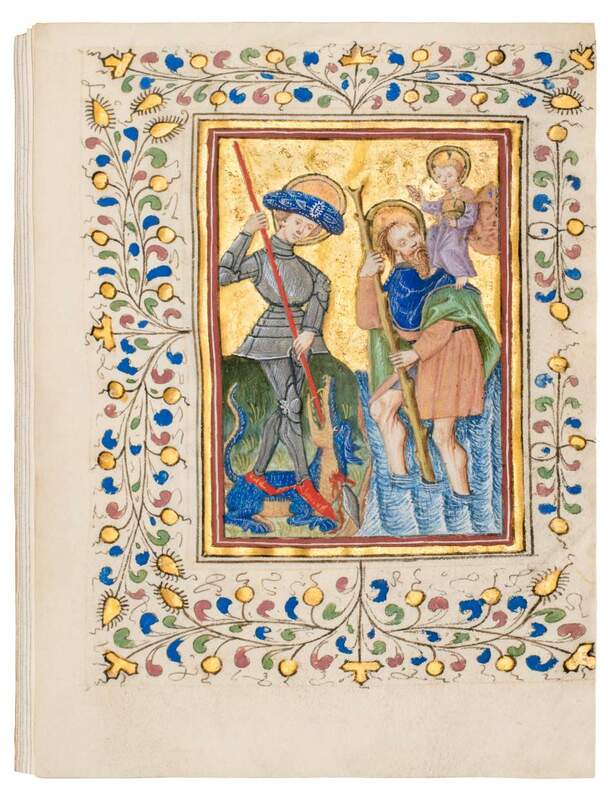 The present Book of Hours offers a unique combination of texts and has a remarkable series of fine miniatures. Whereas these full-page illustrations are painted by the Masters of the Delft Half-Length Figures, who were professional worldy artists, the border decoration in the so-called Delft coloured-style is associated with the Augustinian nuns of St. Agnes, who were responsable for some of the most important dated and signed manuscripts written by women in The Netherlands. This fine prayerbook was likely made as a memorable gift of Hendrik Pietersz Nagel van Voorhout and Immesoet Duyst for their daughter Adriana when she entered the St. Barbara's convent. Their coats of arms shine on several leaves. This finely illuminated manuscript is a major addition to the exceptional book tradition in Delft and enriches our knowledge, not only of Delft's extraordinary spiritual innovation but also of painting in that city, that was stimulated by remarkable patrons. When Hendrick and Immesoet were the first of their dynasty to 'invest' in art – here in the hope that their daughter would pray from the book for the salvation of their souls – their descendant Nicolaes Pietersz Duyst van Voorhout (c. 1600-1650) is known for acquiring art on a larger scale. As he owned portraits of his parents and grandparents, the taste for fine art dated indeed much earlier. The 1650 inventory of his possessions (see our Blog on this topic), shows Claes as an enthusiastic collector of works by Rubens, Goltzius, Van Goyen, and others. His portrait by Frans Hals (now in the Metropolitan Museum in New York) counts as one of the best to have been preserved. Another descendant of Hendrick and Immesoet, the very rich Maria Duyst van Voorhout (1662-1754) is known as patroness of the Fundaties van Renswoude in Delft, The Hague, and Utrecht. Today, these foundations still support young students in their pursuit of education. The extraordinary Duyst van Voorhout manuscript from medieval Delft is remarkable evidence of continued sponsorship of fine art traditions, uniting past and present.